Disciple is the first of the Book of the Immortals series by Kassandra Lynn. Celine died in a plane crash, and now she’s the antagonist of the last book she read before she died. Except, she already knows she’s going to die in the end. The antagonist loses a duel with the protagonist. Celine, now Shann, doesn’t want to die like that. She wants to chart a new course for herself. So with the help of some new friends, and one old one, she tries to do the impossible to save her life. And everything seems stacked against her. I found Disciple a little hard to understand at first, because the world is so different. But I picked up on the nuances and soon got lost in the story. There’s a lot of long time lapses, so the story really takes place over a hundred years. But that’s not all a bad thing, although at times it did slow the story down. I’d recommend this one for a good read, and I’ll be waiting for book two! 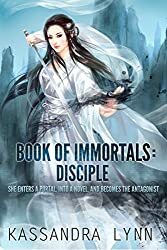 If you wanna, check out Book of Immortals: Disciple: on Amazon or visit Kassandra Lynn’s website for more information.